Keep It Green Recycling owner Kelsey Evans learned first hand that many Vancouver area productions were unknowingly sabotaging their composting efforts by utilizing CPLA cutlery which is in fact not accepted at Vancouver's various compost facilities. This knowledge initiated the search to find a sustainable alternative to CPLA cutlery to help Vancouver area productions keep their composting efforts simple, and their compost stream contaminant free! Although we at Sustainable Lockup encourage the use of reusable cutlery whenever possible, if disposable cutlery is going to be used we believe it should be both accepted into our local area compost facilities and sustainably produced. 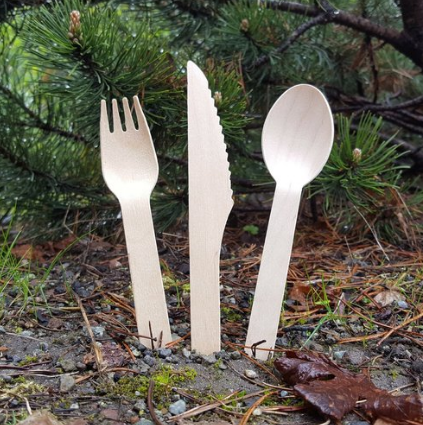 With those specific goals in mind, our feature product offering is FSC certified wooden cutlery that has verified acceptance into all Vancouver area composting facilities!. We are constantly researching and sourcing the most sustainable options available in the marketplace in our efforts to help Vancouver area productions keep their compost stream contaminant free, reduce their production’s food service carbon footprint and to keep their composting efforts simple and uncomplicated. Certifications and features that we actively seek in the products we offer, and in their manufacturing processes, include: FSC certified, USDA BioPreferred, 100% Renewable Resources, Rapidly Renewable Resources, Reclaimed Fiber Resources, ASTM Compliant, BPI Certified, 100% recycled packaging, Post Consumer recycled content, Zero Waste Manufacturing Facilities, SGS, ISO, Certified B Corps, and an eye toward the UN Sustainable Development Goals. All of the products we offer are 100% compostable and have verified acceptance at all of our Vancouver area composting facilities.